Currently, much research is devoted to the study of protein interaction networks. Novel high-throughput technologies produce large networks, which are complemented by interactions manually or automatically extracted from scientific articles. While the structure of these networks has been widely studied, their visualization remains an unsolved problem. Here, we combine both. 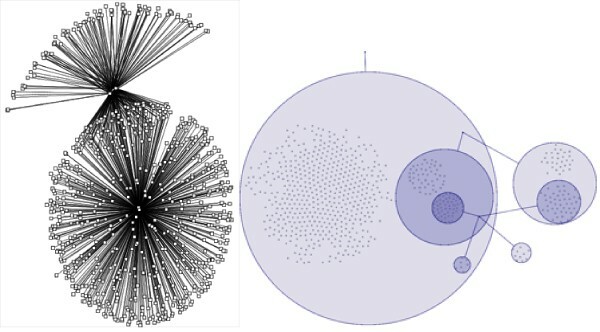 Through an understanding of the modular nature of the networks we are able to define a novel visualization and layout. The key idea of the approach is the identification of modules, which form the complex core of these networks and which share many interaction partners. The corresponding edges to these partners are aggregated and lead to a reduction of edges to be laid out. Our approach is based on two new symbols: power nodes and power edges. A power node stands for a set of nodes, and a power edge connects two sets of nodes and signifies that all nodes of the first set are connected to all nodes of the second set. Using these language primitives it is possible to succinctly represent recurrent patterns in biological networks. In most visualisations of complex networks, and in particular for protein interaction networks, the great number of egdes and edge crossings is the main hindrance for the typical cognitive tasks required for understanding these networks. These tasks are for example determining the neighbours of a node, the possible paths between two nodes, and the existence of cliques and bicliques within the networks. Power Graph Visualization is a lossless method for representing graphs that acheives greater clarity through the reduction in the number of edges needed to represent the networks. We have evaluated the approach on databases such as DIP, HPRD, BioGrid, and Intact covering various experimental methods and species. We achieve an edge reduction of up to 84%. Besides an improved visualization of the networks, the method reveals the networks' underlying structure arising from domain-domain interactions, covering complexes, and reoccurring network motifs. Source of dataset: IntAct Project, Lim et al. 2006. Source of dataset: IntAct Project, Collins et al. 2006.